EXCLUSIVE: Dolphins fan claims she was ejected after kneeling during anthem, saying "a-hole Trump"
Kneeling during the national anthem is not only impacting Dolphins' players, but the controversy has spread to the stands. A season-ticket holder filed a lawsuit saying she was thrown out of Hard Rock Stadium for her political protest. According to the exclusively-obtained documents, Cindy Niad-Hannah was tossed out of the Jets-Dolphins game on October 22. Niad-Hannah claims that during 'The Star-Spangled Banner,' she showed support for the protesting players and South Florida congresswomen Frederica Wilson. In addition, Niad-Hannah said aloud that she was kneeling against "a-hole Trump." A fellow fan heard the remark and alerted security, according to the lawsuit. Later in the game, Niad-Hannah and her husband were escorted out of Hard Rock Stadium by police. Her husband contacted a Dolphins' representative the following day to find out why they had both been kicked out. The representative cited her use of profanity. An exclusively-obtained document shows Niad-Hannah was ejected for taking pictures and blocking the view of other fans. Niad-Hannah claims that this is not the only time that she's had a problem at Hard Rock Stadium this season. In a separate incident, another fan was kicking the back of her chair causing pain to a bulging disc. Niad-Hannah, who is an attorney, is suing for $10,000 saying the Dolphins violated her First Amendment rights. She also wants a refund for the first two games and her parking passes. 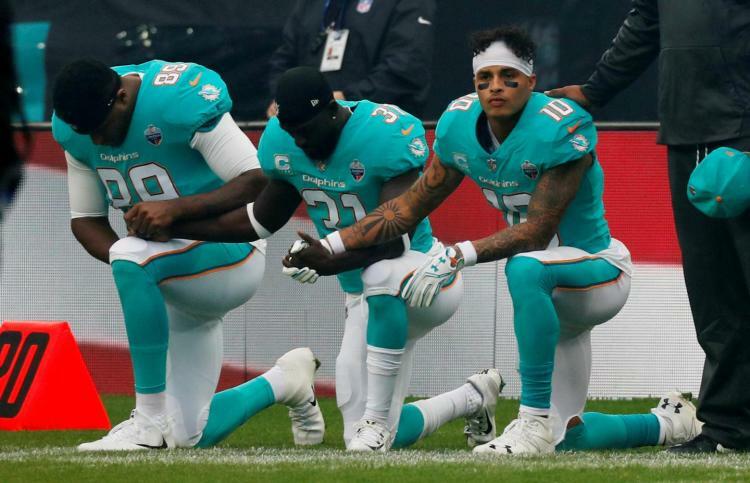 A Miami Dolphins team official denied that Niad-Hannah was ejected for kneeling or for comments about the President.